Liberty/United Artists LO-51130. Rocky III. 1982 LP. 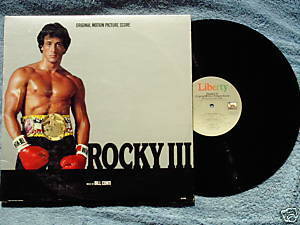 Tracks include Eye of the Tiger (Performed by Survivor), Take You Back (Vocal by Frank Stallone), Pushin' (Vocal by Frank Stallone), Reflections, Miockey (French horn solo Vincent DeRosa; piano solo Mike Lang), Take You Back (vocal by Frank Stallone), Decision, Gonna Fly Now, Adrian, and Conquest. Music by Bill Conti. Vinyl is VG/VG; cover with photos from the film is VG with some seam and corner wear.